As a rule, Frontline distinguishes itself through the breadth and quality, rather than the speed, of its reporting. It is not a program beholden to the 24-hour news cycle; If anything, its producers seek out stories that are being neglected by mainstream media outlets, which of course these days means just about anything other than Donald Trump and face-eating maniacs in Miami. Last week’s stomach-churning report on the risks faced by cell tower climbers is just one recent example of this show’s ability to influence the agenda in a positive way and draw attention to under-reported issues. But even when Frontline turns to more obviously newsworthy subjects, as it does with tonight’s “Al Qaeda In Yemen,” it can be relied upon for brave, thought-provoking journalism. In recent years, Yemen has become a hotbed for terrorism and extremist activity, and last Monday, a suicide bomber killed close to 100 soldiers in the Yemeni capitol of Sanaa, an attack that makes tonight’s report an unusually timely one. At considerable personal risk, correspondent Ghaith Abdul-Ahad—also a writer for The Guardian—and his director, Safa al-Ahmad, travel to various Al Qaeda strongholds in Southern Yemen. First up is the city of Jaar, which is effectively ruled by Ansar al-Sharia, the regional Al Qaeda affiliate. As U.S. ambassador Gerald M. Feierstein explains, this is a highly unique situation. 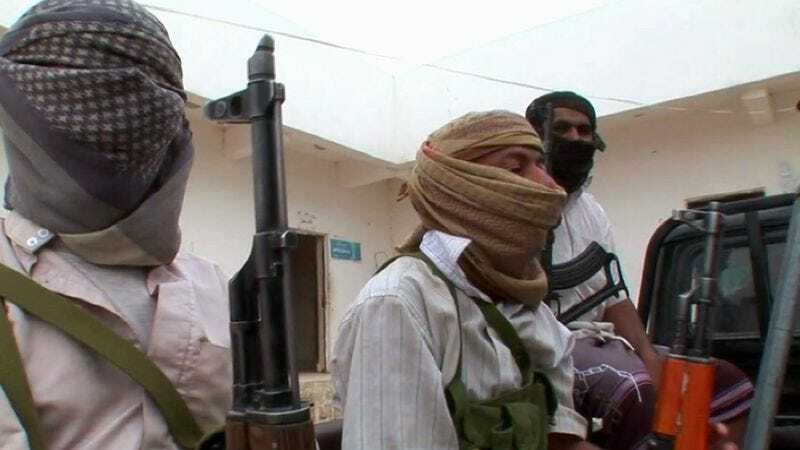 Unlike the Taliban, Al Qaeda doesn’t have a history of actually gaining and holding territory, but the once-diffuse organization is now solidifying its power across Yemen. Their guide on this tour is Fouad, an Al Qaeda spokesman who puts the group’s mission in stark terms: the establishment of their own Islamic state. It’s little wonder that Abdul-Ahad decides to leave Jaar before nightfall; more wondrous is the material he’s able to get in what must have been only a few hours on the ground, including footage of 70 Yemeni soldiers held hostage. The situation in Aden, where Abdul-Ahad waits for the next call from his contact, is not much better. More than a year after the Yemani uprisings began, protests still rage, and there’s considerable resentment toward the military, and it’s not difficult to see why. From their perch on a hillside, soldiers open fire on the funeral of a teenage girl killed just days before—by the army. While he waits to hear about a possible interview with a high-ranking Al Qaeda officer back in Azzan—a man who we eventually learn was killed by American drone attacks on May 6—Abdul-Ahad makes two more stops. He first visits the capitol city of Sanaa, where he finds increasing division among the US-supported military. What, exactly, they’re divided over is not fully explained: this report doesn’t provide a tremendous amount of context for the situation in Yemen, though it almost makes up for this shortcoming with its overwhelming sense of urgency and stunning access. In an eerie moment of foreshadowing, al-Ahmad captures footage of an elite unit of soldiers marching through a square in Sanaa. We are later told that this very unit was attacked in last week’s suicide bombing, in retaliation for the army’s efforts to win back Al Qaeda territory in south Yemen. How’s that for prescient? In the final minutes of the report, Abdul-Ahad goes to Lawder, a town where, a band of local residents has successfully warded off Al Qaeda forces, but theirs is a constant battle. Despite a nearby army base, the men of Lawder are largely left to go it alone. Again, a more thorough explanation might have been useful: Why isn’t the military helping? Are they pro-Al Qaeda in this part of the country, or are they simply too intimidated? In contrast, what makes the local tribal leaders and townspeople so stridently anti-Al Qaeda? In the end, I’m left with a lot of questions, but surely there are worse things than wanting to know more.